Shore Road Allowance, what is this? What is a Shore Road Allowance? 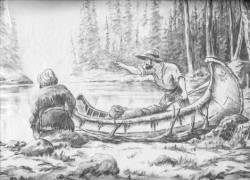 Way back in the pioneer days the initial road allowances in Ontario were established. These allowances of 66 feet wide were created adjacent to many navigable rivers and lakes. These were created to allow to allow business and public passage in a time when travel was most common by canoe. Most of these 'roads' were never opened. Many cottage owners know that there is an allowance in front of their property, however, no one else can purchase the land. As such, many decided that they do not want to go through the expense of closing the road. Can You Purchase a Shore Road Allowance? The local municipality has the final say in closure and title issues of the property and road allowances. The Ministry of Natural Resources has established guidelines affecting closure of some roads for the preservation of wildlife and fish habitat. You will be required to make applications and are responsible for the costs that are determined by the municipality.The purchasing and closing costs will vary, in some areas it may be substantial. If the lot is pie shaped, you might end up with a smaller frontage. There are numerous policies and procedures involved and expert advice should be sought.